The Yamaha YPT 260 is a 2017 update to their popular YPT 255 model, with expanded features and capabilities in the same compact, beginner-friendly keyboard. Yamaha is known for their exceptional digital pianos, and the YPT 260 is no exception. It's a worthy upgrade from its predecessor, as we'll explore in greater detail. 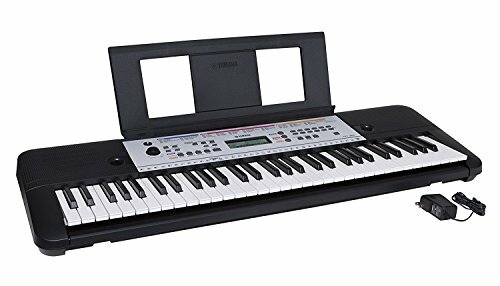 What's Included with the Yamaha YPT260 61-Key Portable Keyboard? The Yamaha YPT260 61-Key Portable Keyboard is sophisticated enough to provide both novices and intermediate piano players with a range of musical choices, expressions, and experiences that make it a great investment in a musical journey. 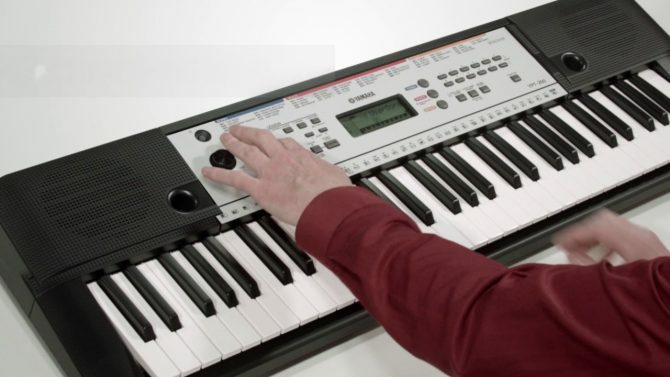 The Yamaha YPT260 61-Key Portable Keyboard is designed for beginners, and easy to use for even complete amateurs. It has built-in education features to make learning the piano fast and fun. It's lightweight and portable, able to be powered with batteries for outdoor play. But it also has more advanced digital piano features for more sophisticated sounds and compositions, going beyond a simple entry-level keyboard. The Yamaha YPT260 61-Key Portable Keyboard is designed for beginners, with the included Yamaha Education Suite and a number of features to make it easy to learn the piano with no prior experience. It's also a great choice for piano teachers, who can use the duo mode and learning suite to give or enhance lessons. However, even though it is an entry-level keyboard, the ability to adjust the eq, transpose chords, and enjoy a wide selection of sounds and backing tracks still provide plenty of advantages as one grows as a musician. These features enable it to grow along with the player, providing more complexity and capabilities over time. 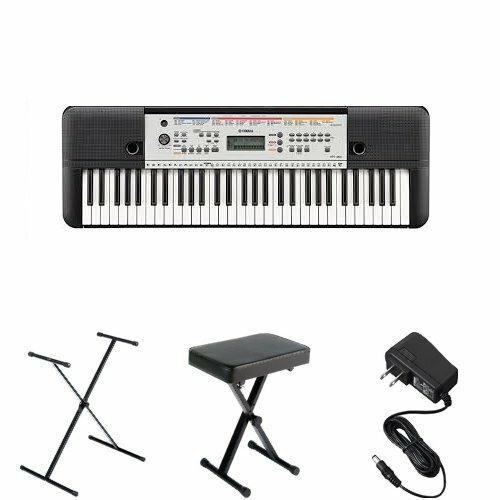 The Yamaha YPT260 61-Key Portable Keyboard comes with a music stand, a power adapter, and a downloadable song book. The LAGRIMA Digital Piano has a wide range of advanced features and musical capabilities. The Yamaha YPT260 has 61 keys, and weighs 8 pounds, 13 ounces. It has an LCD display, and can be powered with the included AC adapter, or with 6 AA batteries. Built-in amplification boosts tones from the onboard 12 cm speakers and produces good quality and loudness when playing the keyboard. It has 384 instrument voices and 16 drum and SFX sounds. It also has 9 types of reverb, 5 types of chorus, and 130 preset accompaniment styles. Transpose and tuning functions allow you to adjust the tone of the instrument. One-touch setting allows you to either use the 4 preset settings, or customize your own voice, style, and effect settings and restore them with the push of a button. Or, use the “Portable Grand” button to have the sound and style of a grand piano at a touch. The Yamaha Education Suite provides practice and exercises for one hand at a time, or both hands together. When learning, use the onboard song library to interactively advance your piano playing. The song playback will adjust to your playing tempo, and the song will pause and wait for you to play the right chord before it goes on, making it easy to learn and play along with the included songs. The downloadable song book includes the sheet music for the included songs, so you can learn to read music while you play. The Yamaha YPT260 tones are generated with Advanced Wave Memory (AWM) stereo sampling. AWM sampling uses high-quality recording and filtering technology to make tones that are expressive, nuanced, and authentic to the source instrument sound. 32 max polyphony isn't a very high number, but many entry-level digital keyboards don't have polyphony capabilities at all, so it's nice to see in the YPT260. Master EQ has 6 styles of customization, so you have greater control over the sound quality. It also has 3 types of ultra-wide stereo, panel sustain, and multi-finger capability, along with style controls to adjust sync start and stop, intro/endings, auto fill-in, etc. Transpose and tuning functions allow you to adjust the tone of the instrument. The YPT260 comes with 112 preset songs with 12 chord study songs. It has a built-in metronome, and a duo function allows you to split the keyboard in half, with two middle C keys. This allows two players to sit beside each other and play simultaneously, and is great for teachers and students. The AUX IN port on the Yamaha YPT260 allows you to connect your own device and hear your favorite music through the instrument speakers, so you can play along with any song you like. It also has a headphone jack, and a jack for a sustain pedal. 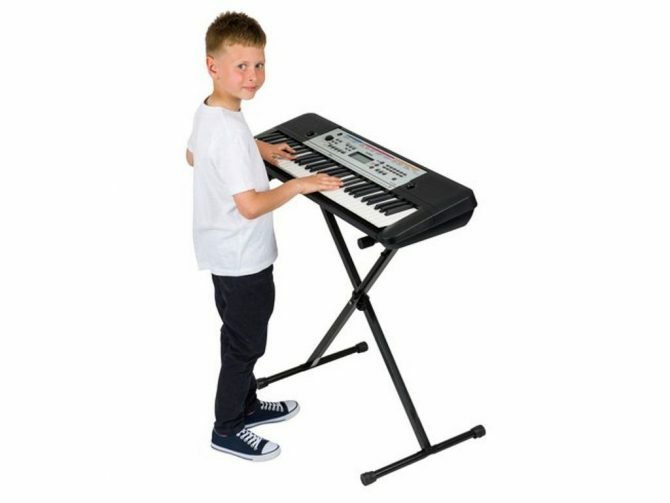 If you are looking for an entry-level piano for a young child who may struggle to concentrate or be reluctant to practice, a good alternative is the Hamzer 61-key portable electronic keyboard piano bundle. Both keyboards have 61 keys, with a variety of available sounds, rhythms, and features to enhance playing. The Yamaha has superior sound quality over the Hamzer, but a child is unlikely to be concerned with the authenticity of sound sampling and audio quality. 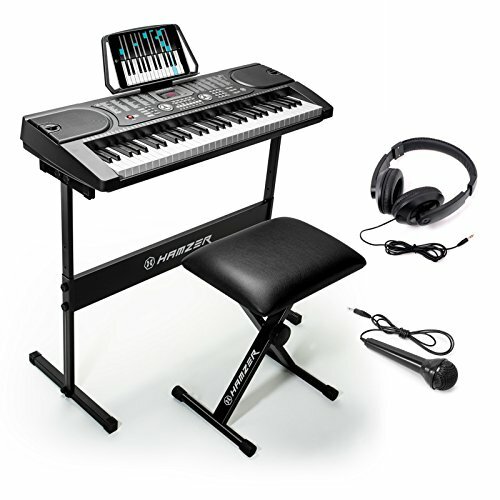 The Hamzer 61-key keyboard bundle from Amazon also comes with a stand, stool, headphones, and microphone that the Yamaha YPT260 does not have. Importantly, the Hamzer is compatible with the award-winning Piano Maestro mobile app, which makes a colorful, interactive game out of learning the piano, and is highly appealing to children, with a wide range of kid-friendly songs. For older learners, the Yamaha is a better option, due to the better audio quality and greater range of capabilities for progressive musical growth and learning. But for young children, the Hamzer and the Piano Maestro app may help to better sustain their interest in learning to play the piano. Most players of the Yamaha YPT260 will need a few accessories to take full advantage of their keyboard's capabilities. For those who are just starting to play the piano, headphones are a must. Not only do they help you hear your own music better, and screen out surrounding noise to boost concentration, but they also prevent you from annoying family or neighbors while you practice. 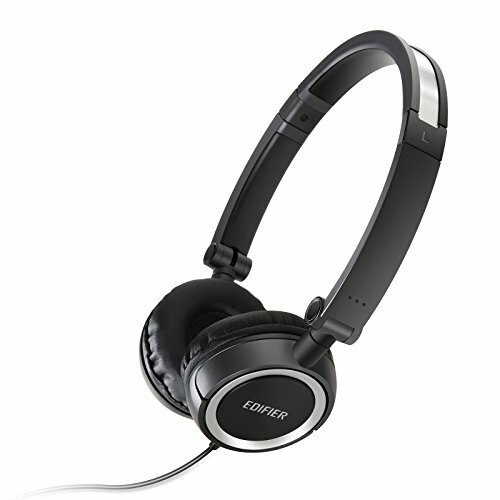 The Edifier H650 headphones are an excellent choice to go with the Yamaha YPT260. Like the keyboard itself, they are lightweight and portable, and even foldable. Like the Yamaha, they provide great sound clarity and quality. They are durable and rugged, and have the noise canceling features you need to play your best. They also come in a wide range of fun colors to suit any taste. They even have a 1 year warranty, so you can try them without risk. When learning to play the piano, it's a good idea to get a pedal and use it early, so you get used to using your feet as well as your hands when you play. The Yamaha YPT260 has a jack for a sustain pedal, and the capability to use it, but doesn't come with one. 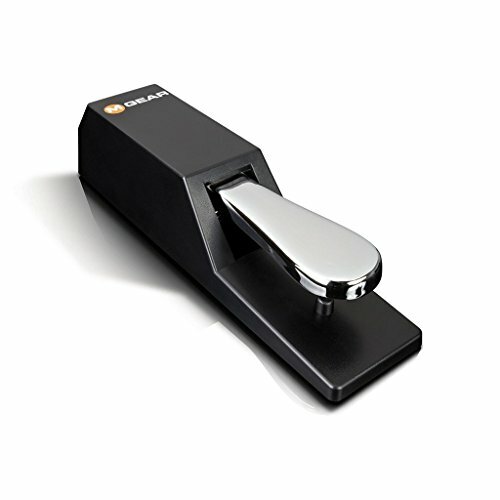 The M-Audio SP-2 Universal Sustain Pedal is a great option, with the classic style and feel of an acoustic piano. It's a high-quality chrome, and has a slip-resistant base for stability while you play. It also has full-pedal and half-pedal capabilities, for a greater range of expression and nuance in your playing. It even comes with a one-year warranty. The Yamaha YPT 260 61-Key Portable Keyboard is the brand's successor to their incredibly popular YPT255 model. It's a good upgrade from that model, with all the same features that made it simple, easy, and friendly for beginners, but with new capabilities and options that provide more room for advanced musical expression as your learning progresses. The YPT 260 is a fantastic starter keyboard, with enough room to grow into an intermediate player, and explore the wonderful world of playing the piano. 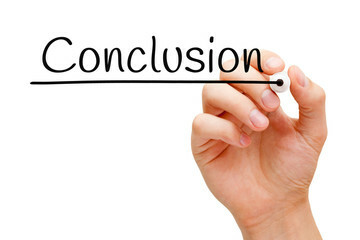 Piano Keyboard Reviews is a participant in the Amazon Services LLC Associates Program, an affiliate advertising program designed to provide a means for sites to earn advertising fees by advertising and linking to Amazon.com.